With a van rented (Thanks Dad) and some severe luggage straps, along with a place to put the press as it would be too heavy to sit in our flat for now (Thanks Toril & Carl), off we went. It was one of the wettest days of the year, but fuelled with bacon sandwiches in true white-van-man style we made it to Preston and the industrial park where the press was located in no time. It turns out that I had found the machine at a scrap merchants who had been instructed not to melt it down and find someone who would put it to use. This was apparently written in the will of the previous owner and was so touching to see his wishes being followed through. 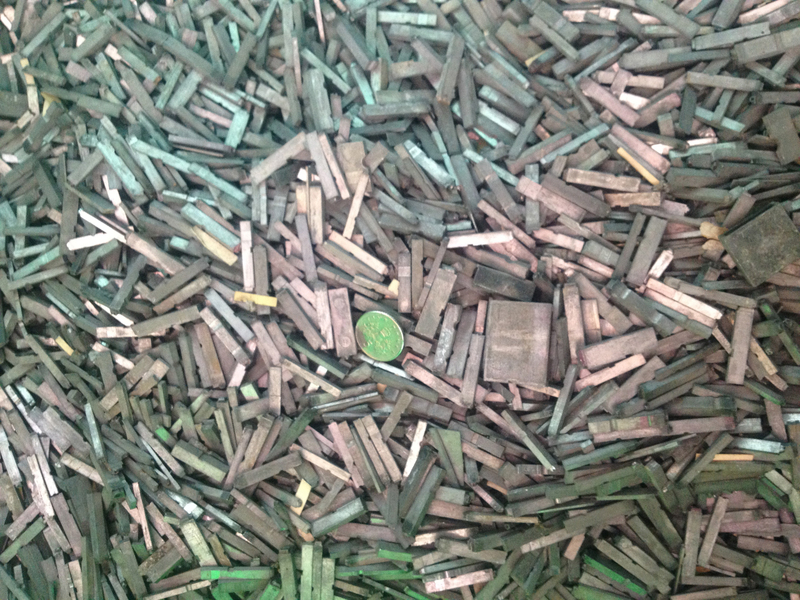 I bought the press at scrap value as well, and it came with around 10 bonus trays of type! The day was going better than expected. [blockquote align=”right”]The Peerless No.2 was manufactured by Cropper & Charlton in Nottingham, around 1910. The chase size is 11×7 inches and is treadle powered. [/blockquote] All we had to do now was get 300 kg of iron into the van. We thought about moving it all in one piece but there was a worry that the weight of the flywheel coupled with a sharp corner would lead to the press toppling over – and I didn’t want to break it before it had even made a print. Luckily, I’d done a bit of research about this beforehand and knew how to split the machine into three more manageable sections. We began by removing the flywheel, which was the hardest part, and then unbolted the legs from the main impression unit. Now between three of us we could lift the sections with relative ease. The press was covered in decades of ink and grime and by the end of this part, so was I, although the important thing was that it was on the van, strapped in securely (with the platen closed to avoid damage). We said our goodbyes and headed back down South. We started rummaging through the collection of type that came with the press and came accross a couple of chases that had been left locked up with compositions for years. One immediately caught our eye – it was the business card of the previous owner. The press apparently was used for printing funeral cards and small jobs by a local Funeral Director named Ivor Whalley. the company, it said, was established over 120 years ago and ran by the same family. After a bit of research I discovered that the company was bought out by the co-operative in around 2004, which explained why the press hasn’t been used for so long. In a little tip-of-the-hat to the previous owner we decided to name the press Ivor, which I think is a rather suitable name for a strong, old machine like the Peerless. Now all we need to do is start printing with Ivor. I knew Ivor for many years, he was the father of one of my dearest friends. The consummate gentleman, warm, hilarious and generous, he would love what you have done with his press, I’m sure. I heard the story but had not found it online until now and admit to passing a few tears reading this. I trust the press serves you well. I remember how much he loved it and couldn’t wait to share the results. I love that you’ve called it Ivor – so very fitting! Such a lovely story – I’m so pleased that you got in touch! I have been in contact with Ivor’s family and they all tell me the same, he sounds like he was a great man with many interesting stories to tell. It’s amazing that you and Ivor’s family have found this site, it was only for me to document my adventures in print. When talking with Ivor’s brother we realised that his nephew lives within half a mile from me in London too – I hope to have a drink with him soon. Such a small world. I’m proud to have saved the press, and print on it as much as I can – currently my wedding invitations are being made by Ivor… He prints very well. Thanks again for getting in touch, I’m glad you approve of the name!